All windows and sliding glass doors must go through basic testing that results in an AAMA classification; commonly called NAFS (North American Fenestration Standard). Local building codes reference this standard accompanied by an AAMA class (R, LC, CW or AW) and a design pressure (50,55,60 etc.). The class and design pressure dictate the rating of the window according to what part of the country it goes into. 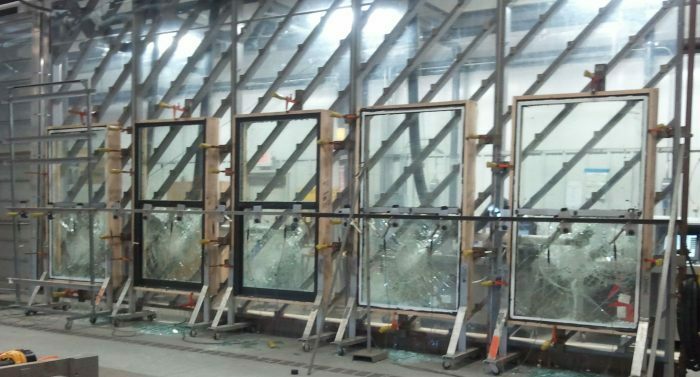 Testing is meant to simulate the stresses a window or sliding glass door may go through during typical use. Hurricane Impact Testing conducted at Architectural Testing, Inc. in Schofield, WI. The ability to test components and assembled products is crucial to the quality and performance of our products. We have an in-house test and prototype lab with an excellent staff, whose job it is to make sure that our parts and processes are held to the highest standard of quality.